Madam TBL from Sekinchan, Selangor had been struggling hard to have a child of her own for two years. She underwent 2 IUI cycles in 2009 in other center, without success. She then decided to come to Metro IVF for further treatment to have a baby of her own. After consultation and investigation with our fertility specialist, Dr Tee Swi Peng, the couple was found to have male infertility. She was started on long protocol IVF treatment and egg pick-up was done on 10th December 2010. She had 8-cells-embryos transferred on 13th December 2010. Three weeks later, a single intrauterine gestational sac with fetal heart was detected. Her pregnancy progressed well and she delivered a healthy baby girl weighing 2.8 kg at Hospital Wanita Metro. At last the couple started their family. Two years later, she returned back to Metro IVF wanting to have a second baby. She had her second IVF treatment which was unsuccessful. However, she had frozen embryos. Six months later, she had frozen embryos transferred using her natural cycle. 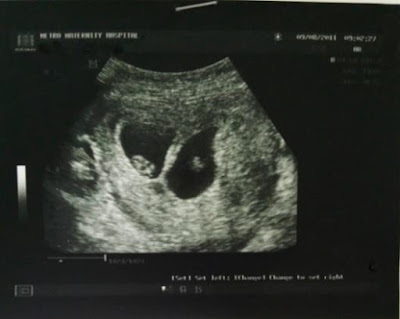 Five weeks later, ultrasound scan showed 2 pregnancy sacs with fetal heart present. Wow! She had twin pregnancy. Her twin pregnancy progressed well. At 20th weeks, detailed scan showed she had 2 healthy boys. Wow! The couple was very happy indeed. They delivered 2 healthy boys by Caesarean on 11 August 2015 weighing 1.97 kg and 2.05 kg. The couple and their in-laws were extremely happy because finally they have completed their family with 2 boys and 1 girl of their own. Madam Chang, from Klang, had tried to conceive for 2 years after their marriage. They decided to come to Metro for consultation and assistant to have a baby of their own. Initial investigation showed that her right fallopian tube was blocked, hormone level was normal and sperm count was normal. She was advised for IVF with ICSI treatment and their first treatment cycle was in November 2010 which was not successful. Their determination and never give up attitude made them came back to Metro IVF to start her second IVF cycle in May 2011. She had her embryo transfer on 29th June 2011. 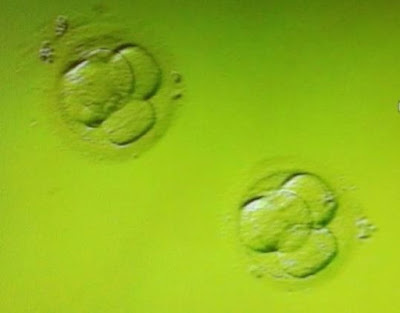 Three 4-cells-embryos was transferred on day 2. Her 2 weeks was uneventful. Four weeks later, ultrasound scan showed she had 1 pregnancy sac. The following week, ultrasound scan showed she had 2 pregnancy sacs with 2 fetal hearts. So happy! She had twin pregnancy. Her twin pregnancy progressed well. At 20th week, detailed scan showed she had two healthy girls. She delivered the 2 girls weighing 2.5 kg and 2.1 kg by Caesarean on 1st March 2012. She came back to Metro IVF in February 2015 wanting another child. She proceed with IVF treatment and egg pick up was performed on 28th February 2015. Two 4-cell-embryos with Grade-1 and Grade-2 were transferred. Her two weeks was uneventful. On 12 March (i.e. 12 days post egg pick up) her serum β-hCG was 153.1 IU/L and her urine pregnancy test was positive. She delivered at 38th week gestation, a baby boy weighing 3 kg. The couple was so happy they have completed their family with 2 girls and 1 boy of their own following IVF treatment. 2 pregnancy sacs with 2 fetus at 7th week.